Ooh, look what else I've found on the Reboot site. : this is my pecha kucha... I mean, this is my "micropresentation" about increasing the power of your hyperlinks (with microformats ...of course). I made it back from Copenhagen using one plane, three trains, a tube and a lot of time. Reboot was good fun. I met some nice people, had some pleasant conversations and watched some invigorating presentations. All in all, a cool little conference. It’s interesting to read some of the post-reboot blog posts. Most first-time attendees were blown away while some people who were there last year said that this year’s event didn’t quite have the same “wow” factor. While it wasn’t South By Southwest, I certainly enjoyed myself although some of the pre-reboot hype may have raised my expectations higher than was warranted. Reboot was a fairly hands-off sort of affair, more talk than code. It made for an interesting counterpoint to XTech. After two days though, I was itching to cry “show, don’t tell!” There was a lot of talk about what an exciting time we’re living in and how world-changing our work can be, but I would have welcomed a practical workshop on changing the world in ten easy steps. I also really enjoyed Jean-Francois Groff’s t-shirt illustrated stroll down memory lane. 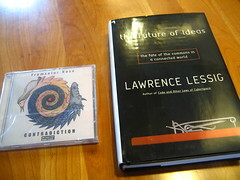 His first hand recollections of CERN and the invention of the Web got me all fired up for my own historical overview. But, as usual, the daytime schedule tells only half the story. A good conference, like the Web itself, is all about people. It was really nice to meet so many people of varying nationalities. After the pre-conference boat ride on the first night, I had dinner with five people from five different countries. Stick that in your pipe, Paul Graham.